Wasp Control | wasp nest specialists | get rid wasp nest today. Have you got Wasps? Why not give us a buzz and get rid of your problem today! We can eradicate your wasp or hornet nest fast! Hi there, many thanks for visiting our web site. During the summer months, one of the most commonly encountered nuisance pests that householders find themselves having to face is Wasps and Hornets. Despite being surprisingly useful insects, the sheer numbers in a nest, coupled with the fact that they sting (which can be life-threatening), puts the Wasp at the top of the list for eradication. If you suspect that you have a wasp or hornets' nest, then you have come to the right place. We are confident that we can solve your wasp problem fast so please take a moment to read through the pages on our site, it will only take a few minutes and will help you describe your wasp problem to us. Then give us a call and get rid of your wasps today! We have put together some useful information pages to help you identify and understand wasps, hornets and bees. Please check our Hampshire Wasp Control area map to see who to call, or use our postcode search facility for a more accurate result. 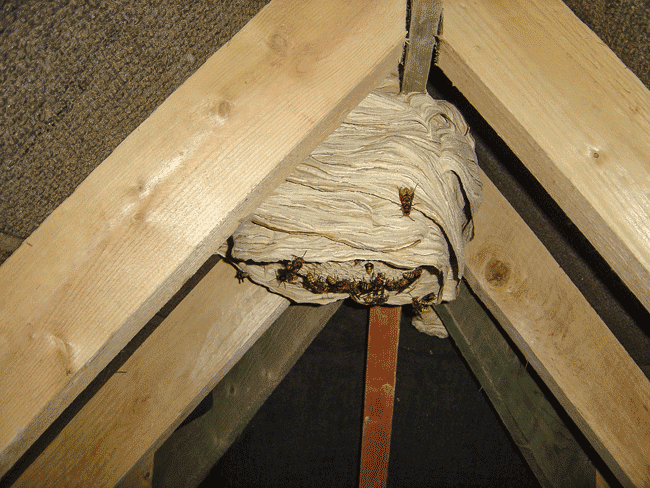 It doesn't matter where your wasp or hornet nest is, if it's a small nest in your garden or a large hornet nest in your loft, we can get the job done promptly and safely. No nest it too big or small. We have never failed to treat a wasp or hornet nest! 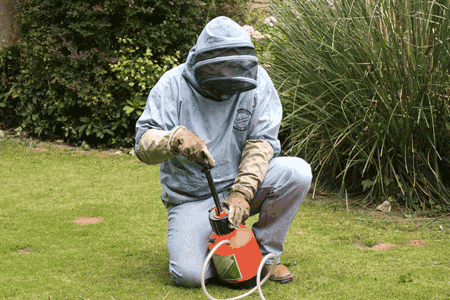 Hampshire Wasp Control aims to treat your nest the same day as you call us or the next day at the latest. Before calling, please take a quick look at the following video clips, they will help you identify your problem. 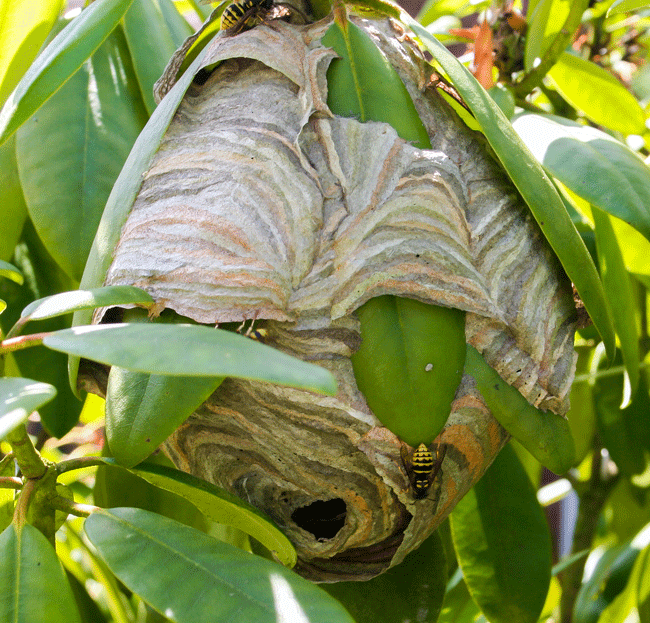 The first video is predominantly wasps, showing different nesting scenarios. Please watch and compare your problem to the ones in the clips. The second video shows a selection of clips including honey bees and bumble bees. Please watch and compare your wasp problem to the clips showing bees. Pay attention to the insect's action and behaviour for comparison. We ask you to do this because, we do not treat any bees! The Andover Beekeepers Association provide a free honey bee swarm collection service. Contact details and further information is available on the site. Use our sitemap to navigate to any of our pages. If you are unsure if we cover your area, please do not hesitate to call us. We will be happy to help. April - May - what is happening at this time of the year. For the next few weeks, a large number of people will misidentify wasps and its all due to our little friend the mason bee. 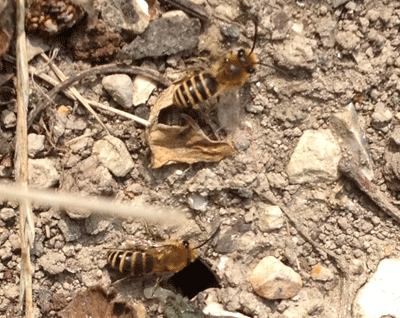 These little bees are short lived and only last for about 6 - 8 weeks in the spring. Once they have mated and laid eggs for the next generation, they die. These harmless little fellows look similar to wasps, but upon close inspection, you can see that they are fluffy. Mason bees are some of our best pollinators as they collect pollen differently from honey bees. 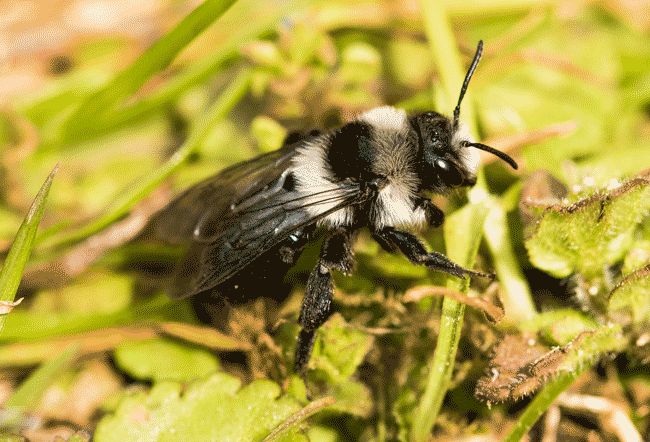 Instead of cleaning and storing pollen on their legs like honey bees, mason bees get it stuck all over them and hope for the best. Far more pollen falls off of them compared to honey bees and helps with pollination of our plant life. It is suggested that one mason bee will do as much pollination as 100 honey bees. 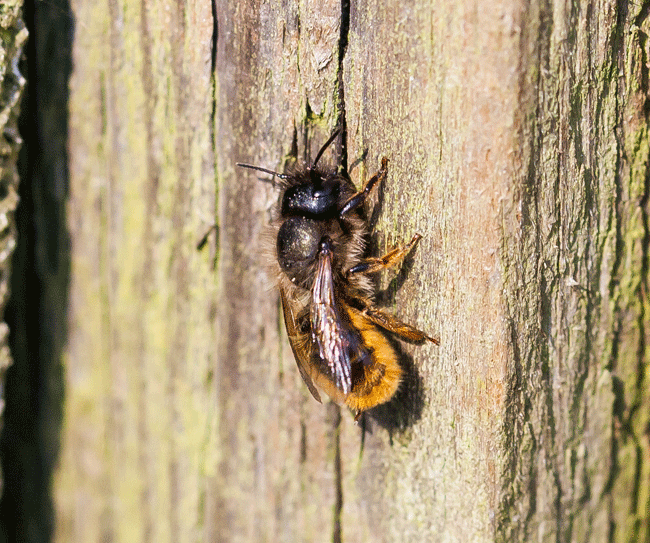 Mason bees love to get into small holes in brickwork, wood, and around windows. Their favourite place is small plastic weep vents which are installed in the brickwork of modern homes. Usually, the numbers of bees present are quite low, less than 50. Mining bees are similar but burrow into the ground, they create a small hole, just slightly larger than a wormhole, leaving what looks like a mini volcano on the top. If you have either of these species, we urge you to leave them alone; they are harmless and beneficial. There are many species and sizes of both Mason and Mining bee.